Permeate pumps are designed to use the water pressure of the brine water of your reverse osmosis system to pump the treated water, the “permeate”, into your pressure tank. They do not require any electricity – they just use the hydraulic energy that normally goes to the drain unused. This process effectively reduces the membrane back pressure to less than 5 psi, and allows the membrane to take full advantage of the available feed pressure, greatly increasing efficiency and dramatically reducing the waste water. A typical reverse osmosis system without a permeate pump utilizes an automatic shut-off valve that stops the RO system from producing water when the holding tank reaches 50%-67% of the incoming water pressure. As the holding tank gets close to being full, the quality of the water produced by the system begins to diminish, as well as sending more water down the drain due to the increasing back pressure from the holding tank. When a permeate pump is installed, the RO membrane is isolated from this back pressure and allows the RO membrane to operate with up to nearly the incoming water pressure, even when the holding tank is nearly full. This dramatically improves the efficiency of the membrane and overall quality of your water, reducing waste water by 80% or more, as well as increasing the pressure and related volume of stored water in the holding tank. 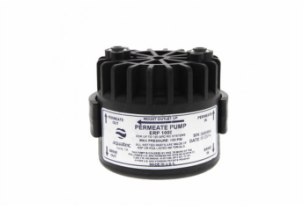 A permeate pump can be installed into almost every existing under-counter RO system. • Improves membrane life, prevents “TDS creep"